Want to be Safety Fast-er? Here's a suggestion made by Peter Laidler of the MG Owners' Club. His idea is to use a combination of new, easily obtainable (?) second-hand and existing MGB components. Be very careful when modifying your braking system. Changing the piston diameter on the front discs can cause a drastic change in the way your MGB handles under braking. In fact, on a single-circuit system, there may be no way to adjust the system adequately, although variation in the slave cylinder size on the rear drums (or conversion to rear discs) may do the trick. On a dual-circuit system, changes in master cylinder diameter may be required. In any case, a study of the handling under braking on a skid pad in dry and wet conditions both before and after any modification would be, in my opinion, absolutely necessary. If you don't know how to design and test a braking system, don't change the components! MGB disc shields (to be modified). Set of calipers from Triumph 2000. Calliper pistonseal kit x 1 (8G 8641). The most expensive parts shown are, obviously, the V8 discs but they are the essential ingredient to improved braking, being thicker and giving improved heat dispersal and thus increased efficiency. The Triumph calipers are stripped and the outer halves disposed of along with the bridge bolts and seals. Hook out the metal rings holding the piston seals into the inner halves and bang the half-calliper down onto a block of wood until the piston falls out. Remove the inner seal, thoroughly clean the calliper halves, renew the seals and refit the pistons. After removing and dismantling the MGB's callipers, the inner calliper halves are discarded. After renewing the outer halves' piston seals the Triumph inner and MGB outer halves are bolted together using the new components listed. The bridge bolts should be torqued up to 35-37 lb/ft. The resultant callipers are hybrid replicas of the standard V8 callipers at a fraction of the cost! "I am gathering the parts to do this conversion and have found that the early MKI Triumph 2000 uses a .350" rotor, the late MKIs and MKIIs use a .500" rotor. I would recommend that when you source the calipers to be sure they are from a Triumph 2000 that had .500" rotors." Comments on "Building MGB V8 Brakes"
I am currently going through this process and building a set of hybrid V8 calipers. 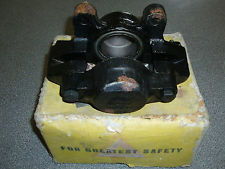 I have used later Triumph 1/2" caliper inner halves with the standard MGB outer halves including new seals and bolts. Perfect! They are currently being blasted primed and painted. Yes they fit perfectly!! !